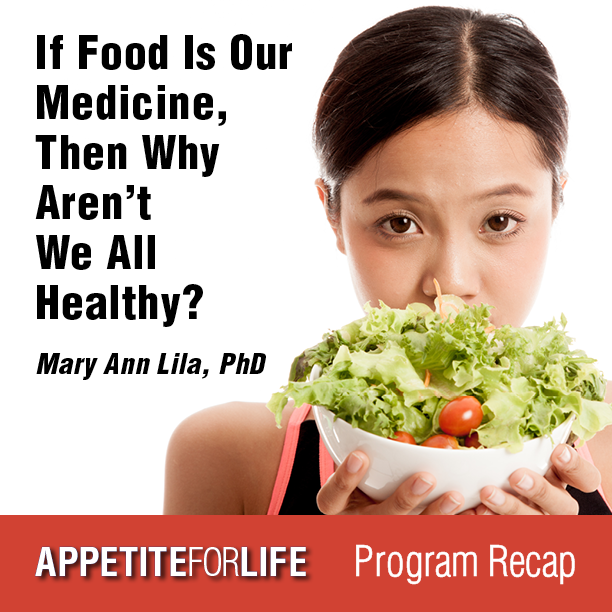 If Food Is Our Medicine, Why Aren’t We All Healthy? February 27, 2019 –If you missed February’s Appetite for Life presentation by Mary Ann Lila, PhD, you can catch up. Watch the entire program on video now. The live presentation took place at Forty-Six in Kannapolis on Tuesday, February 12, 2019. In her talk, Dr. Lila explains that the right amount of food plus the right amount of exercise is key to good health, but not all foods are created equal, not even raw, whole foods. As humans have evolved from hunting and gathering food to modern systems of farming, many of our crops have been modified to provide higher yields, sustain long shipping periods, and produce sweeter and more perfect looking crops to satisfy consumers. The result is beautiful, tasty food that often is depleted in nutrients and phytoactives. Polyphenols are key phytoactive components of fruits and vegetables and have been linked to health outcomes: Such polyphenols as flavonoids, stilbenes and ellagic acid are believed to help prevent chronic disease and promote health. Because of the way polyphenols are metabolized, the nutrients are best absorbed and used by our bodies when we exercise. Dr. Lila presents findings from studies that demonstrate this clearly. Getting people to eat well and exercise regularly, however, is still a problem leaving many people nutritionally deficient. Her research has led to the development of a food-delivery system in which health-protective plant ingredients are combined with protein particles in a novel application that ensures bioavailability. Learn all about this fascinating approach to nutrition-related health concerns by viewing the video here.